I Want a Brighter and Whiter Smile! Many patients are interested in a brighter and whiter smile and want to know more about bleaching. 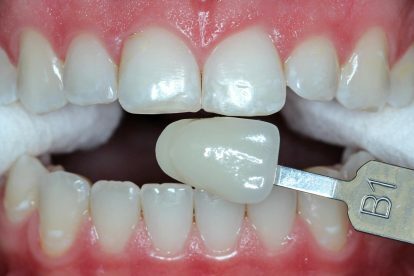 To understand how bleaching works, we can first look at why teeth appear dark or stained. One common reason is the consumption of darkly colored drinks. Enjoying drinks like tea and coffee can eventually lead to staining that can’t be removed with a toothbrush. This type of staining is called “extrinsic staining” and is the staining that responds the best to bleaching. Other types of staining are built into the teeth from an early age. For example, if we are exposed to certain antibiotics while the teeth are developing, we can develop “intrinsic staining”. This is the type of staining doesn’t respond as well to bleaching. Other causes of staining include, loss of calcium, cavities, and problems with the nerves. Now that we understand some basics of teeth staining, we can see how bleaching products work. Once a whitening product has been applied to the teeth, it becomes active by breaking down into smaller compounds. This breakdown is important because it also causes the stain compounds to breakdown, making them harder to see. Then, the whitening product can help bring these smaller particles to the surface to be washed away. The overall effect is a brighter and whiter smile. We encourage all patients to see the dentist routinely to maintain their oral health. During your check-up, let us know your concerns about staining and we’ll let you know your options for teeth bleaching. We’re here to help you meet your goals whether it’s been awhile or you’re already receiving routine care.